Two best friends try to get more people to watch their public access t.v program. I love Wayne's World. My whole family loves Wayne's World. It's one of the few films that my mum, dad, brother (who is 5 years older than me) and me will actually all watch together and all like it. It's so funny and so bad it's good. I really love Garth I think he is hilarious and just so sweet. I also think this film contains one of the greatest scenes in film history. A car full of friends singing and dancing along to bohemian rhapsody is just so funny I laugh every time. 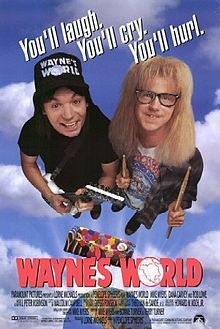 Wayne's world is just so strange and funny that I think everyone must like it.